With well over three decades of experience within the industry of manufacturing glass balustrades, Unique Metal & Glass Company Ltd. (UMG) is happy to provide targeted solutions for a wide spectrum of clients. 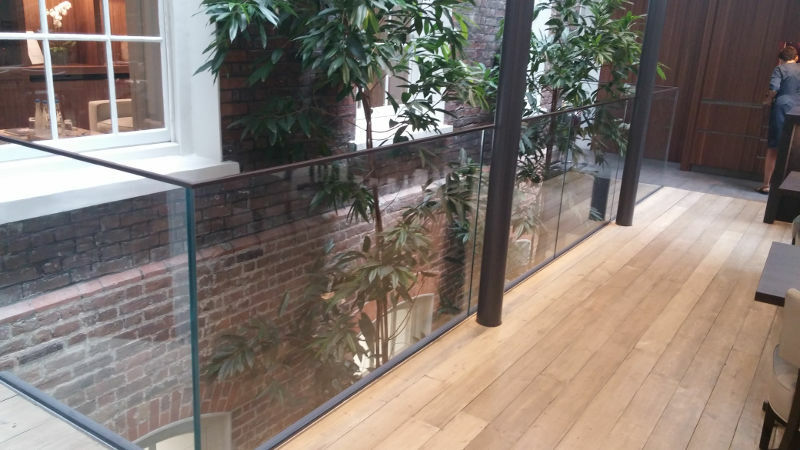 Not only can balustrades add a bespoke sense of beauty to any environment, but we should also highlight the fact that they are very important in terms of building safety. Let’s take a look at some of the features which enable these additions to be sensible alternatives. By their very nature, glass balustrades are able to allow in a significant amount of light. This can be critical when the location of individual steps needs to be highlighted. The chances of a slip or a fall are therefore massively reduced. This also signifies that less artificial lighting will be needed. A properly lit staircase is a concern within any building; particularly one that is associated with a high level of foot traffic on a daily basis. The balustrades manufactured by UMG are extremely strong and durable. This could come as a surprise many, as they are under the assumption that this type of glass is fragile. Nothing could be further from the truth. Thanks to in-house proprietary formulations, our tempered glass can support a great deal of weight and is highly resistant to cracking or breaking. In the rare event that a break does indeed occur, cubes as opposed to shards will be produced. Thus, the chances of a user suffering injuries are virtually eliminated. One of the issues with standard horizontal metal or wooden rails is that there are many gaps within their design. These are most likely to occur between the top, middle and bottom rails. Gaps can present problems for young children who may accidentally slip and fall through them to the ground below. With the use of a full sheet of glass, this risk has now been mitigated. In other words, it is simply not possible for one to fall through this type of railing system. Balusters are vertical poles (either wooden or metallic) that are placed in between the separate support posts (sometimes referred to as “newel” posts). There can be times when extremely young or old individuals may tangle their feet in between these intermediary poles. Once again, this can result in a slip, a fall or a significant injury. Glass panels have eliminated the need for these smaller posts. There can be times when our balustrades are utilised around the exterior of a property. In this case, they are able to supply an additional level of building safety. Besides the aforementioned benefit of supplying an ample supply of light, the glass itself is a very useful barrier against elements such as wind-driven rain. The result will be a stairwell that remains drier for longer periods of time. This is another excellent means to prevent slips and falls when ascending or descending. Metallic balustrades can corrode and produce potentially harmful chemicals over time. Wooden variants may trap more germs and they are often associated with mould and mildew. The smooth and non-porous surface of glass eliminates these concerns. Our units can be quickly cleaned and therefore, they are much more sanitary when compared to traditional materials. UMG takes a great deal of pride in our ability to produce turnkey glass balustrades around the needs of the client. When building safety is a top priority, our team of trained technicians will be more than happy to help.